Although loosing or misplacing keys can be frustrating, it is very common among people unfortunately. Often when people lose or misplace a key to their home or vehicle, it would have a costly result. Aside from calling a professional locksmith to bail them out, there is the uncertainty of the keys falling to the wrong hands. With today’s technology, there is no reason to worry about these things anymore. Yes you can upgrade the lock system at your home to a key-less entry, but if you wish to keep the existing locks, we have a solution that will help you next time you lose or misplace your keys. Various gadgets are now available in the market that will assist you in finding your keys in case they got lost or forgotten somewhere. One of these tracking gadget is The Button TrackR which comes in a form of small tags. 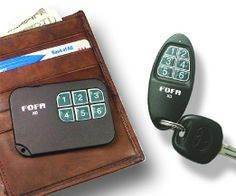 They can be used on up to 10 different items which include other things than keys as well. Once the tags were attached to your keys, they can be tracked using an app on your smartphone. In addition, it offers alert notifications which act as a reminder to keep your keys close. Find One Find All is another type of key finder that is a little less advance than the one previously mentioned, but still get the job done in finding your lost keys. It comes in a form of a card size tag which incorporate an RFID chip for tracking. This large tag supposedly go into your pocket or wallet where-else a smaller corresponding tag goes into your key chain or ring. Once you lose or misplace the keys, the card tag in your wallet can be activated which will send a signal to the smaller tag which is part of the key ring. When the signal is received by the smaller tag, a red flashing light will appear and an alarm sound will be sound. The range of this tag is limited for up to 30 feet. Last but not list is The Pixie. From most of the gadgets that are used to find and track keys, this one is among the precisest ones. Most key finders will only give you an approximate location of your lost keys which can be in a certain radius. However, using the smartphone app of The Pixie, you will be able to detect the exact location of your lost keys within inches. Although it comes in the same form of tag like many other key finders in the market, different than others, The Pixie incorporates a camera and a compass as part of the tracking process. The camera on your smartphone will be activated while a compass will show on the screen pointing you to the exact location of the keys in addition to an X mark marking them. This entry was posted in Locksmith Tips and tagged find one find all, key, lock, locksmith, locksmith reno, rekey, reno, reno locksmith, the button trackr, the pixie. Bookmark the permalink.